Finnair on 07-Oct-2015 took delivery of its first A350 XWB, becoming the third operator overall – after Qatar Airways and Vietnam Airlines – and the first in Europe. The aircraft brings needed benefits to the airline: lower operating costs and an improved passenger product. The A350s also mark the start of more growth for Finnair’s home base, Helsinki Airport, which is expanding its terminal to support Finnair. 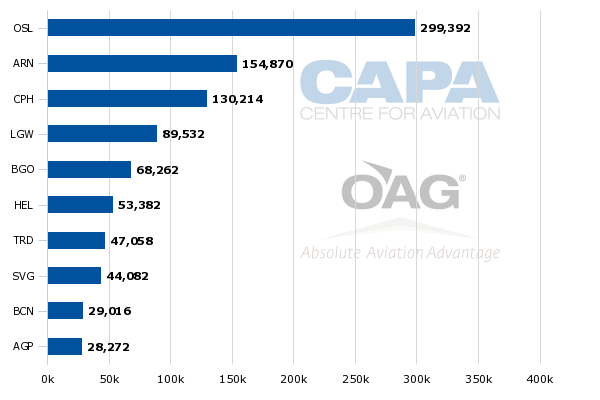 After replacing A340s, the A350s will permit growth, with Helsinki Airport telling CAPA it expects each aircraft to open one or two new destinations a year. Finnair’s strategy is to link Europe with Asia, focusing on Northeast Asia. Helsinki Airport has many of the main Asian markets covered, leaving open the opportunity for increased frequency – slots permitting – or exploring secondary cities. Finnair has announced Fukuoka and Guangzhou for new destinations in 2016. Helsinki would like more North American routes, which Norwegian could consider. The LCC is testing longer flights from Helsinki with a Dubai service. Gulf carriers are absent from Helsinki – as are other long-haul operators excluding Japan Airlines. Helsinki Airport's challenge now will be to benefit from Finnair and attract new airlines. Finnair A350 growth to focus on Northeast Asia – which markets? Finnair's first A350 arrived in Helsinki on 07-Oct-2015, a few days delayed. The aircraft was due to start commercial flights (short-haul) on 05-Oct-2015. Finnair has 19 of the type on order. They are due to replace its seven A340-300s and then provide growth, with Finnair using about one aircraft a year for long haul growth. (Finnair also operates eight A330-300s.) This is to help Finnair achieve its goal of doubling its Asian traffic between 2010 and 2020. Helsinki Airport anticipates its largest volume growth through the end of the decade will come from Asia. Orders include those placed directly by the operator and by lessors assigned to the operator, from 2-Oct-2015 onwards. Helsinki Airport's strongest Asian destinations already have Finnair service. In Northeast Asia, this is mainland China (Beijing and Shanghai in addition to Chongqing and Xi'an), Hong Kong, Japan (Nagoya, Osaka and Tokyo) and Korea (Seoul). In Southeast Asia, Finnair serves Bangkok, Ho Chi Minh and Singapore in addition to seasonal service to Krabi and Phuket. Bangkok and Hong Kong receive at least daily service (there is double daily in peak periods). All other services are daily or less. Helsinki anticipates the opportunity to grow frequencies. However, slots are congested at most of Finnair's major ports. Secondary cities can be challenging in terms of an untested market or low yields, especially in China where secondary cities mostly have leisure demand. Finnair is one of a number of intercontinental carriers in Chongqing, but was the only carrier in Xi'an (seasonal only) until United Airlines announced service for 2016 (seasonal only as well). There is a wealth of secondary Chinese cities to consider, but the challenge is profitability, even with generous local incentives. Busan would be the only other logical point to consider in Korea, but Korea is trying to dissuade long haul service into Busan in order to boost Seoul Airport operations and fortify the national hub. Finnair already has one of the widest networks in Japan in terms of destinations and will expand with a service in 2016 to Fukuoka, its fourth point in Japan. KLM had a service to Fukuoka but plans to cancel this in 2016. There are strong Dutch links to Fukuoka, and KLM was hoping these would contribute to success. This may mean that if KLM cannot make it work, there are weak prospects for other long haul carriers. Alternatively, this may free up space for Finnair to enter with a smaller aircraft (KLM used a 777-200) and potentially wider connecting market since Helsinki is not as far inland in Europe as is KLM's Amsterdam hub. But it is likely Finnair's decision to enter Fukuoka was made before KLM's recent announcement to exit the market, giving a boost to Finnair. Finnair's Fukuoka announcement was made during its celebrations for A350 deliveries. Finnair also announced in 2016 it would open service to Guangzhou in southern China, near Hong Kong. Finnair opened three weekly flights to Guangzhou in 2005 but closed the service in 2008, citing limited Northern European corporate demand in Guangzhou. 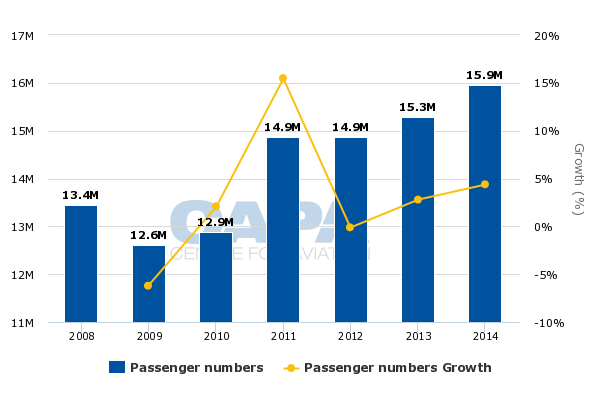 Finnair hopes that growth in the Chinese market as well as Finnair's internal changes (connectivity strategy, European feed, cost reductions) will give it a second shot in Guangzhou. Of European carriers in Guangzhou, Finnair joins Aeroflot, Air France and Turkish. Gulf connecting carriers Emirates and Qatar also serve Guangzhou. Other foreign long-haul operators into Guangzhou are Egyptair, Ethiopian Airlines, Iraqi Airways, Kenya Airways, Mahan Air and Saudia. Finnair has not announced frequency for Fukuoka and Guangzhou. Looking at Asian flights by European city, London is clearly the largest followed by Paris and Frankfurt. Amsterdam is smaller but ahead of the next pack, which includes Helsinki, Munich and Zurich. For the 24th week in 2015, Helsinki is the fifth largest airport in Europe for Asian flights, according to a Finavia presentation. 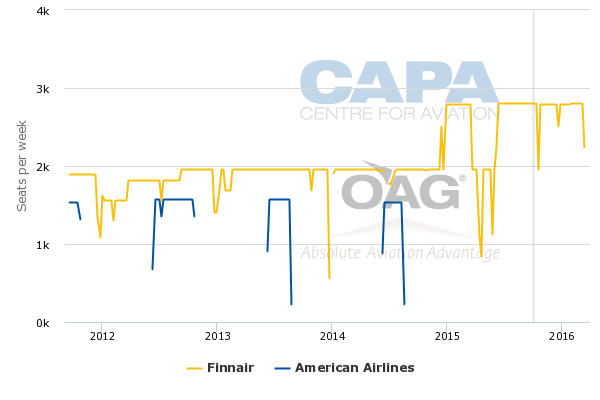 American Airlines had offered seasonal Chicago-Helsinki service, but this has been picked up by Finnair. Finnair joined the American/British Airways/Iberia trans-Atlantic JV. This has left all trans-Atlantic flying to Finnair. Scheduling changes in Sep-2015 indicate Finnair will increase Chicago service, make Miami a year-round destination and discontinue Toronto service. Helsinki would like more North American carriers and service to Los Angeles and San Francisco. Its lack of North American carriers is not uncommon but Helsinki's situation is less competitive than peer Scandinavian carriers. In 2015, Copenhagen saw service from Air Canada and Delta while Stockholm saw service from Delta and United and Oslo service only from United. United is now following Delta in making flights seasonal only. 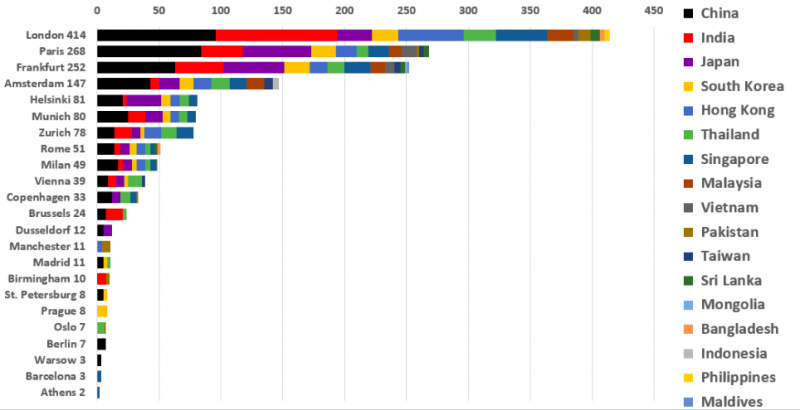 Helsinki's situation is further disadvantaged compared to Copenhagen, Oslo and Stockholm as those three carriers see service from SAS in addition to Norwegian. However, Helsinki hopes Norwegian will consider Helsinki as a future long-haul base. Norwegian is embarking on what could prove a very important experiment. The LCC will launch a daily Helsinki-Dubai service on 19-Nov-2015. Although this will be operated with a 737-800, with a six hour flying time it gives Norwegian exposure to the Helsinki market's appetite for longer flights on a low cost platform. Helsinki Airport hopes Norwegian's Dubai service could lead to widebody services, such as to the US. The service will be operated by Norwegian Air International, which operates the group's long haul services. The comparison between the Dubai service and future long haul flights may not be so clear. 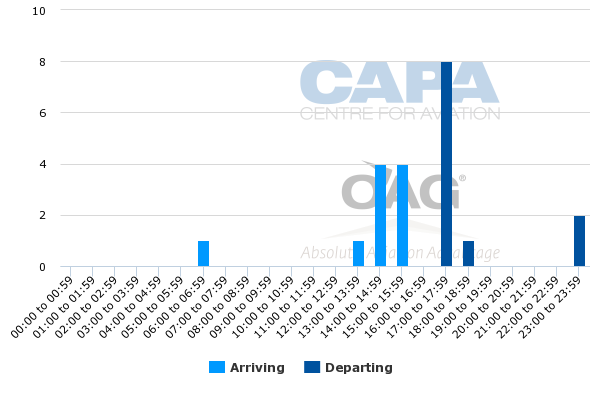 The Dubai service operates overnight, allowing Norwegian to utilise an aircraft that would otherwise have sat not flying for much of the night; a long haul 787 service will carry a higher capital cost. As for passenger willingness to fly a LCC long haul, a narrowbody six hour service may be viewed less positively than a widebody service on a longer flight. Norwegian's long haul services – to Bangkok and US points – depart from Copenhagen, Oslo and Stockholm and recently London Gatwick. These departure points are unsurprising: they are Norwegian's four largest bases. At these points Norwegian has a local presence, bringing market familiarity and connecting opportunities. This concentration of long haul services reduces station and other overhead costs. Helsinki is Norwegian's next largest unserved long haul base after Bergen (Bergen has seen limited long haul services). Helsinki calculates it is the largest market in Europe that Gulf carriers do not serve. The lack of a single flight from Emirates, Etihad and Qatar contrasts to Copenhagen, which will be the first destination for Emirates’ 615-seat A380. Qatar Airways is responding to Emirates’ growth by increasing its frequencies. Overall, the Copenhagen-Gulf market will grow 43%. See related report: Copenhagen Airport's Gulf and Asian growth: 615-seat Emirates A380, soon Cathay and Air India? Gulf carriers are hesitant about Helsinki – although they and Helsinki airport see a service as inevitable. They see Finns as having very strong loyalty to Finnair, as well as travel preferences to Northeast Asia and Thailand. Helsinki-Northeast Asia connections are too circuitous via the Gulf. Southeast Asia is the signature market for Gulf carriers from Europe, but Gulf carriers reckon Finnair is holding a competitive enough position. In peak periods Finnair has two flights a day (on average: 1.4 a day across the year) to Bangkok, as well as to Krabi and Phuket. Finnair also serves Dubai, which is a growing destination (and not just transfer point) for some Europeans. When Qatar Airways was in discussions to join the oneworld alliance, it was only Finnair that persisted with reservations. Finnair was concerned about Gulf impacts on its Asian traffic, on which Finnair has effectively pinned its central strategy. Finnair was eventually placated and Qatar joined the alliance, so the continuing lack of Gulf presence in Helsinki provides some relief to Finnair. 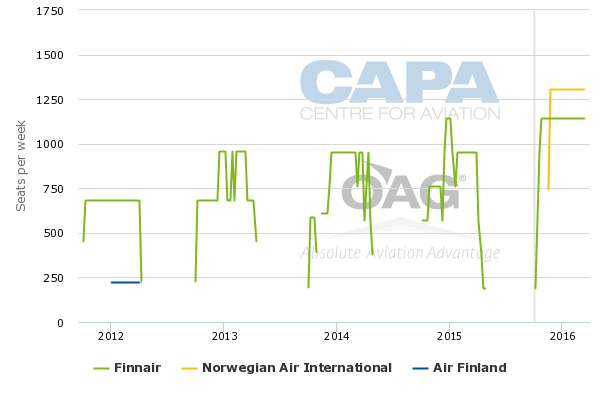 But Gulf carrier presences in Finnair's transfer markets nevertheless mean Finnair still feels their competitive impact. It is not just Gulf carriers that are absent from Helsinki. Helsinki receives very limited service from Thomas Cook and Thomson to assorted beach markets: seven flights for all of 2015 to Jamaica’s Montego Bay, six flights in 2015 to Mauritius. The only other major long-haul operator at Helsinki is Japan Airlines, which in 2013 commenced a service from Tokyo Narita that is now daily with the 787-8. 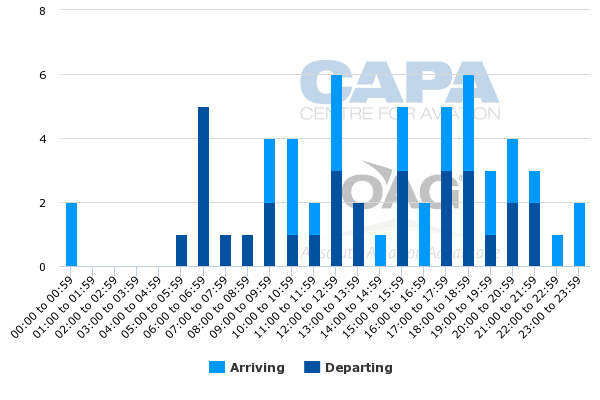 Helsinki Airport says JAL’s service sees a similar share of traffic connect beyond Helsinki (70-80%) as Finnair’s long-haul services do. There is prospect for JAL to up-gauge Helsinki from a 787-8 to 787-9, but probably not to increase frequency. JAL's daily service compares to Finnair's daily service to Tokyo Narita and daily service to each Nagoya and Osaka Kansai (in winter they decrease to five weekly). 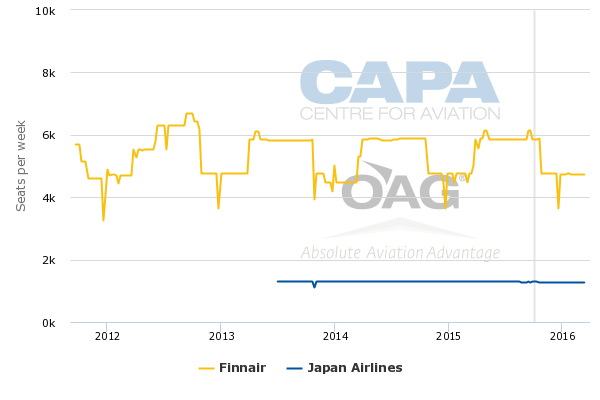 Finnair in Oct-2015 has an 82% share of the Helsinki-Japan market; however British Airways, Finnair and JAL participate in a Europe-Japan JV. With JAL’s service demonstrating the need for onward connections – a position Finnair dominates – Helsinki Airport is naturally looking towards oneworld airlines as they would be better positioned to partner with Finnair. Finnair accounts for 67% of seat capacity at Helsinki (the next carrier, Norwegian, is at 13%). 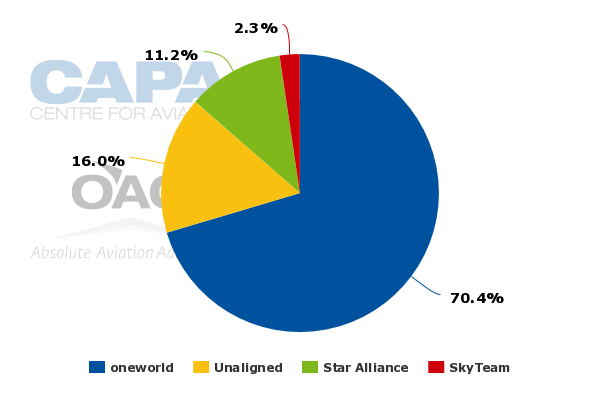 Finnair's oneworld alliance accounts for 70% of seat capacity. 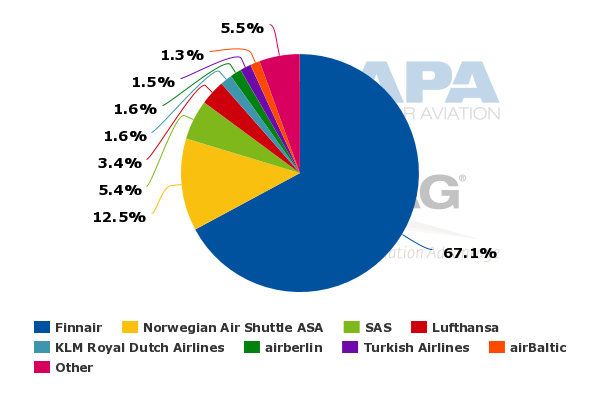 The next largest group is not SkyTeam or Star, but unaligned carriers (influenced by Norwegian's large presence) with a 16% share. Although Helsinki would like a service from Cathay Pacific, it sees that being unrealistic given Finnair’s existing coverage of Hong Kong (and mainland China). Finnair offers a daily Hong Kong service with supplementary flights during the peak season. A service from Malaysia Airlines would expand Helsinki's Southeast Asian network and would be nice, but again Helsinki sees the challenge, this time of Malaysia Airlines restructuring and decreasing long haul services. To boost connectivity, Helsinki offers the lowest transfer passenger charges of major European airports. Helsinki Airport is undertaking an expansion programme to add widebody gates and terminal space to support Finnair's growth. With its connecting traffic focus, Finnair's long haul services are naturally coordinated around scheduling banks. Finnair tries to operate long-haul services within a 24 hour window, allowing an aircraft to depart Helsinki and return within a day. Some points including Hong Kong and Singapore are exceptions due to longer distances and the market's demand for overnight services in both directions. Helsinki's Terminal one is for Schengen services, and the greater number of these services means frequency is spread throughout the day, although there are clear peaks and troughs. The concentration of Finnair's Asian network is evident in the graph below showing arriving and departing flights to/from Asia. Finnair has a main bank consisting of afternoon arrivals and evening departues (to mainland China, Japan, Korea and Thailand). A smaller bank sees departures in the late evening for Hong Kong and Singapore. These flights return in the morning. While the non-Schengen terminal may be quiet during certain parts of the day, the concentration at peak hours requires the facility to be expanded. Helsinki operator Finavia will add eight widebody gates by 2020, first by expanding the terminal's finger by 2017 and then completing the remainder of the expansion programme around 2019/2020. There is one widebody gate that can be accessed from the Schengen side. Finnair deploys a widebody on select weekly frequencies to Brussels and London Heathrow in order to facilitate cargo transfer. 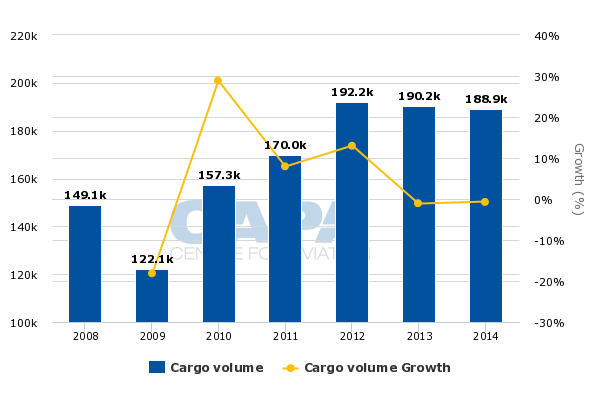 Cargo volumes in 2014 declined for the second year in a row, although still above their previous 2011 peak. This downwards trend is continuing in 2015. 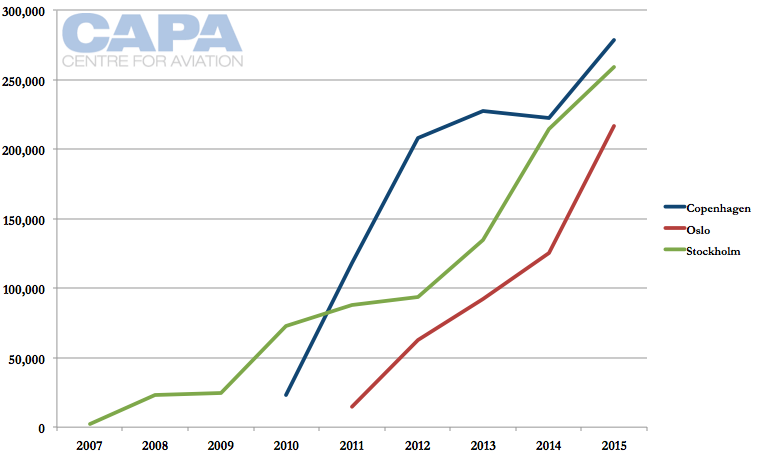 Passenger traffic is a stronger story, with 3-4% growth in 2013 and 2014. 8M2015 traffic is up 1.9%. Helsinki is heavily reliant on Finnair, which has been restructuring but unable to lower costs to match yields. Even if or when Finnair finds a firmer financial standing, growing in Asia comes with challenges; doubling traffic over a decade will require dedication and some luck. This is Finnair's – and therefore Helsinki's – main market.